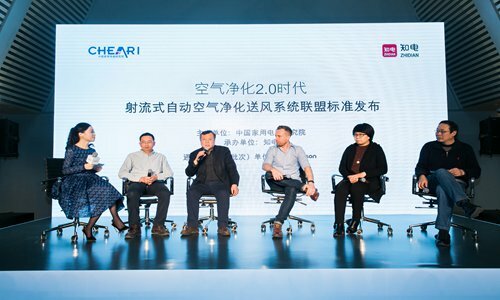 China Household Appliance Standard and Technology Industry Alliance, an affiliation of China's leading home appliance agency - China Household Electronic Appliance Research Institute (CHEARI) - released the first global association standard for intelligent air purifying fans in Beijing on January 23. By sensing pollution, capturing it and then circulating cleaner air, these machines are engineered to properly purify the air in a room. Working in conjunction with the British technology company Dyson's engineers, experts at CHEARI have constructed a 27-square-meter test chamber designed to better reflect the average home size of Chinese consumers. Research suggests that the average size of a Chinese living room is 27 square meters. The new method will sit alongside China's existing national standard, which uses a smaller testing chamber at 12 square meters to test machines under max mode only. The existing standards have no measurement of intelligence or whether a machine delivers uniform cleaning in a larger family room. The new testing method assesses a machine's ability to remove harmful particles and gases, the uniformity of the cleaning performance delivered around the whole room and airflow projection. All machines are tested using their automatic pollution detection function. By enlarging the size of the test chamber compared to the existing purifier standard and increasing the number of test sensors to nine, the chamber is able to detect the accuracy of a machine's automatic functions and ensure that the machine cleans all the air in the room properly. In the context of a home, it would ensure that a person on one side of the room receives a similar air quality to a person on the other side of the room. There is also no need to manually change the machine based on guesswork or costly air quality monitors. "We are always looking at ways to accurately guide consumers toward technologies by integrating high performance, smartness and uniformity of purification, and we recognize the growing need for intelligent air purifying fans," Lu Jianguo, the Chief Test Engineer at CHEARI said. "Dyson leads the way in this category of purification so we've worked closely with their engineers to bring a test method to China that pushes the purification agenda forward and welcome other manufacturers to enter into this new category."